The ASRock X399 Phantom Gaming 6 hardware is one of the cheapest X399 motherboard currently on the market and brings the Phantom Gaming name to the high-end desktop market. This entry-level option for Threadripper uses a 2.5 gigabit ethernet controller, and is one of only a few boards to do so. It also offers a trio of M.2 slots, a full x16/x16/x16 for multiple GPUs, but supports only for Threadripper processors up to 16 cores due to its design. One of the often labelled criticisms at the high-end desktop market is the motherboard price. In order to take advantage of more cores, more memory slots, and overall more features, users have often needed to step up their motherboard choice, as well as paying $1000 or more for the processor and memory. 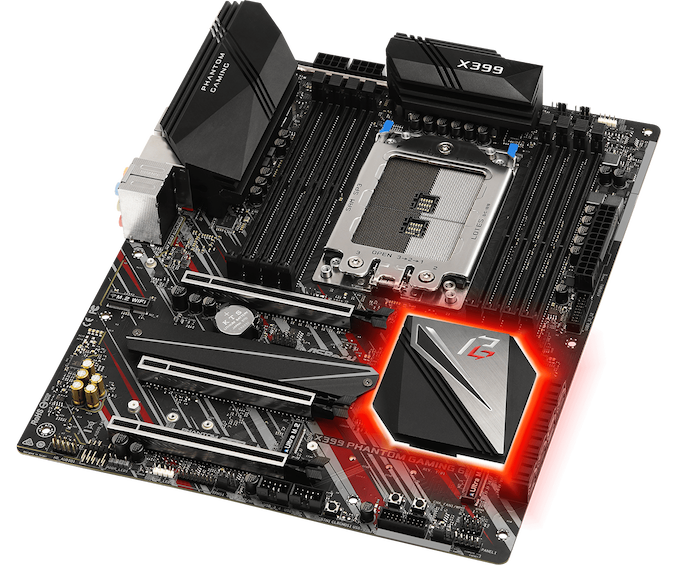 There are some forces at some of the motherboard companies to bring the high-end desktop motherboard market to something more cost sensitive, and this is what ASRock has produced in the X399 Phantom Gaming 6, which has a list price of only $250. This is extremely beneficial when a lot of motherboards in this segment start at $320. To add to the basket of positives, ASRock also enabled this motherboard with a few unique features, such as 2.5 gigabit ethernet, and expanded on common features, like triple M.2 for storage. The X399 Phantom Gaming 6 represents the cheapest of four Threadripper motherboards from ASRock under $400, with the others being the X399 Taichi ($320), the X399 Fatal1ty Professional Gaming ($390) and the micro-ATX X399M Taichi ($300). Being cheaper than normal doesn't detract from the feature set. Aside from a Realtek Gaming 2.5 gigabit ethernet, the board has full support for two DIMMs per channel of memory (up to DDR4-3400), three full-sized PCIe slots connected to the CPU, space for an M.2 Wi-Fi module, enhanced audio, and dual networking ports. One of the ways that makes the X399 Phantom Gaming 6 one of the cheapest boards is the processor support: ASRock has built this motherboard to support AMD Threadripper with a thermal design point of up to 180 W, which means it can only support up to 16 core processors such as the AMD Threadripper 2950X. Because ASRock’s focus for this model is to offer users an entry-level pathway to the high-end desktop, this is a fair compromise. Moving away from the old Fatal1ty gaming branding has been a smart move for ASRock. ASRock’s new Phantom Gaming series has adopted a subtler color theme with black metallic heatsinks. The X399 chipset heatsink has integrated RGB LEDs as well as ASRock has included two regular RGB headers and a single addressable RGB header. Users can use the tool within the UEFI firmware or with the ASRock Polychrome RGB software. Differing slightly in PCIe slots from the ASRock X399 Taichi that we reviewed, the ASRock X399 Phantom Gaming 6 has three full-length PCIe 3.0 x16 slots with support for both 3-way NVIDIA SLI and AMD Crossfire multi-graphics cards configurations. There are no PCIe 3.0 x1 slots present, but there is a trio of M.2 slots which all have support for NVMe boot drives and ASRock’s U.2 kit which is supplied separately. The eight SATA ports offer support for RAID 0, 1 and 10 arrays. In our testing, the ASRock X399 Phantom Gaming 6 when paired with a Threadripper 2950X processor was as expected and did perform better than the first generation Threadripper 1950X. The system tests showed that with our test bench, it was quicker at POSTing into Windows than the MSI MEG X399 Creation model, but way off the mark of other boards on test. On the other hand, the deferred procedure call latency performance was much better which can be attributed to the change of processor as much as the board; we do intend to add an addendum with some 1950X testing too in the very near future. In gaming, there is very little difference in performance between the 1950X and 2950X, with Total War: WARHAMMER still showing the same signs of multi-core optimization issues we faced with the 1950X. Other than that, performance is in the same ballpark we would have hoped for. It’s understandable why the ASRock X399 Phantom Gaming 6 is limited to supporting 180 W due to the 6+2 power phase power delivery. The power delivery consists of six Intersil ISL69147 60 A power stages for the V-Core without doublers. It’s more than ample for 180 W CPUs, but it could struggle with 250 W and the decision to lock down support is appropriate. The overclocking performance with the Ryzen Threadipper 2950X was very competitive and VDroop didn’t show any cause for concern. From 3.9 GHz to 4.2 GHz with our manual overclocks, VDroop was positive with around 0.0.1 V between the CPU Core voltage in the BIOS and when at load. This reversed itself at 4.2 GHz when it undervolted by a margin of around 0.02 V at full load. By default, the ASRock X399 Phantom Gaming 6 doesn’t fully apply Precision Boost Overdrive with the automatic setting and by enabling it, the performance increase at the cost of temperature and power does seem a fair compromise. 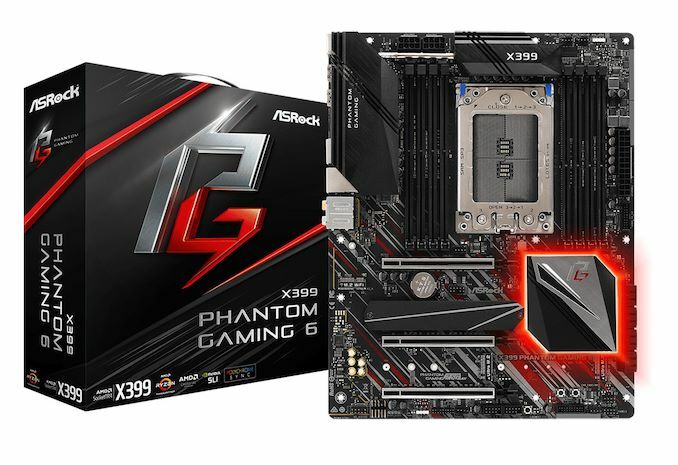 The ASRock X399 Phantom Gaming 6 not only enters the market as the cheapest Threadripper board at a price of $250, but it brings about gaming specific features such as the Realtek 2.5 GbE gaming NIC to a more price sensitive point.. ASRock has aimed at the entry level for enthusiasts who like to have fun and capped support at 180 W but offers plenty of premium features commonly associated at the price point. Dual NIC, triple M.2 and three-way SLI support at $250 is impressive and ASRock looks to make the entry point to Threadripper more affordable without sacrificing on the feature-set and overall quality. On a similar note, why is it listed as "Non-UEFI POST Time"? Are you actually disabling UEFI and going with a legacy BIOS for post time? Why, and how does that affect post time? I imagine anybody using this board will want to use UEFI. Yes, this MB has some good design choices. For the price. I would have preferred to have either a 10G Ethernet adapter or a PCIe2.0x4 slot, e.g. where the heatsinked M.2 slot is (and the battery should be moved somewhere else. In my opinion 10G is taking off (I already have a direct 10G link between my X399 and my server) and will soon be within reach for most consumers. Having to occupy a x16 slot for a 10G adapter sends shivers down my spine. Plus, you could also wish to use a 4x4 bifurcation adapter board to install more nvme SSDs (3 is sometimes not enough) and then you'll be left with a single slot for a GPU. "The audio PCB is separate from the rest of the PCB"
"For the start of our Z390 reviews" I think should read "Since the start of our Z390 reviews"